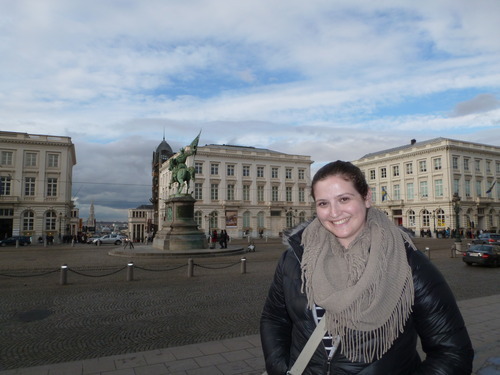 Well, here is the last installment of my time in Belgium! If you haven’t read parts 1 or 2, click HERE and HERE for them, respectively. And to see my photos that I’ve been posting, CLICK HERE. Alright, I think we can begin with part 3! Happy Valentine’s Day! I know, the holiday will be over by the time this is posted, but still, might as well get into the festive spirit. Now I’m not a big Valentine’s person, probably because I’ve been single on Valentine’s Day every year (with just one exception). But today, I chose to fully embrace the holiday and be the best Valentine I could possibly be…for myself! I chose to book a chocolate tasting tour! So that, my readers, is what I will be talking about in this post. Hope it doesn’t make you drool too much. I had a bit of a lazy start to the day, as I didn’t have to check out until 11am and the tour didn’t start until 2pm. So I took my time, took a nice shower, gathered my things, and set out for the day. I was able to leave my things in the luggage room again, so I decided to just walk aimlessly around Brussels until I had to be at the tour meeting spot (which, surprisingly, wasn’t the Grand-Place). 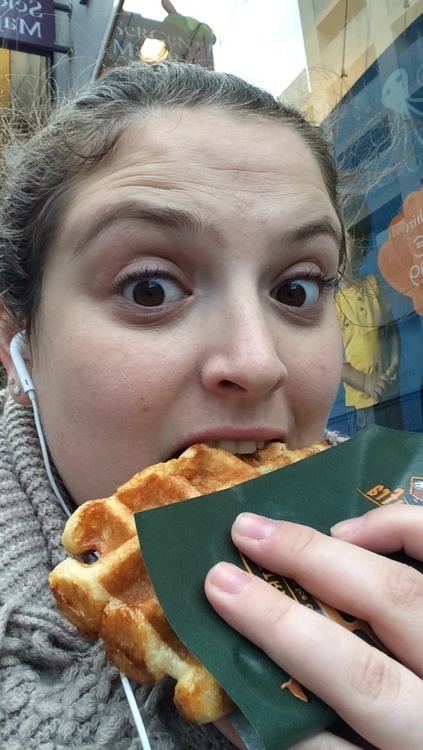 I started my day off with a waffle, because I was hungry and this is Belgium. I went back to the same place as the day before. It was equally as delicious. Sculpture of a train, I believe. The sign was in French, so I don’t know what it said, but it was really cool! After killing time, I went to the meeting spot, a chocolate store in the Royal Galleries. It was getting very close to 2pm, and I didn’t see anyone outside of the shop. I wasn’t able to get wifi, so I went into the shop to ask if they knew when the person would be there. The shopkeeper was very confused and told me that no, they didn’t offer tours. Out of the corner of my eye, I spotted a young woman speaking to a couple, and I approached them. Success! It was the guide! Her name was Wanda, and she was a 31-year-old film student from Amsterdam, with a big passion for chocolate. This really showed throughout the tour. I was joined by a young married couple from London (the husband had surprised the wife with a trip to Brussels that morning, since she loves chocolate – how, literally, sweet!) and also by two girls from Boston who met up for the weekend while studying abroad in different places in Europe. The couple was very friendly, while the girls kept mostly to themselves. Wanda told us that she would be guiding us from the lowest to higher quality chocolates throughout Brussels. Well, she specifically said that she’d take us from flying on EasyJet/RyanAir to flying First Class on Emirates. Okay, here we go! So Leonida’s is a big chain throughout Belgium (maybe also throughout Europe, but I can’t remember). Wanda said that Leonida’s is where you go to buy chocolate to binge on, not really for decadence. She gave a us a white chocolate piece, filled with a coffee ganache (like a buttercream) and a praline (bits of ground up almond). It was good, but very sweet and way too big. Neuhas was another chain, a little more high end that Leonida’s. We were given a simple chocolate truffle covered in cocoa powder. Very rich, but nothing too special. Mary was yet another chain. The first 3 stops were all near each other in the Royal Galleries, a big tourist spot, so Wanda explained that tourists don’t really know where to go to get the best of the best in Brussels. At Mary, we tried a piece of milk chocolate with Tonka Bean-flavored ganache. Wanda told us that Tonka Beans are illegal in the U.S. because they can cause liver damage in high doses. It was a very interesting taste, almost almond-y. I enjoyed this one. 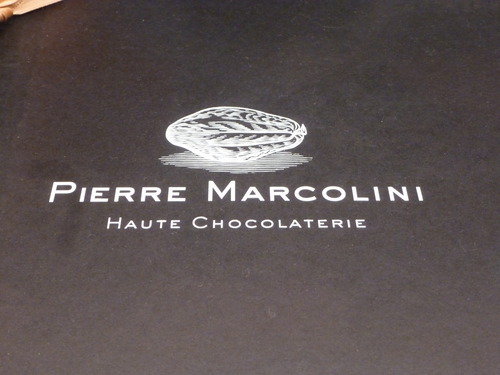 We then took a walk to a different area of the city to try more of the higher-end chocolatiers. I spoke with Wanda about our separate travel experiences over the years. She was a really great person to talk to. We stopped for some photo ops. Frederic Blondeel was actually a cool stop. First of all, it was Wanda’s favorite place to get chocolate in Brussels. Second, all of the chocolate is fair trade and the chocolatier meticulously tastes all of the beans throughout the process so the taste is always right. Here, we tried a dark chocolate with a basil-flavored praline. Wanda challenged us to put the whole piece in our mouth and let it dissolve on our tongues, like chocolate tasters do. While I liked the idea, the piece was too big. I mentioned this to Wanda, and she said she agreed and in the future, would have tour-goers bite the chocolate in half and THEN complete the challenge. The basil was really subtle, so subtle that I honestly couldn’t taste it. But the dark chocolate was very decadent and enjoyable. This shop was incredibly crowded, so I couldn’t get a good picture. This was one of the higher end places where Belgians go to get their chocolates. Everyone seemed to be getting their last-minute Valentine’s chocolates when we were there. They were giving out free samples: dark chocolate with a ginger ganache. Very interesting! Wanda also got us another flavor to try called Four Spices. We once again had a challenge: guess the 4 spices! I guessed cinnamon, which was correct. The other 3 were cardamom, cloves, and chili. It was very interesting. Here we are, flying First Class on Emirates Air! Patrick Roger is a master chocolatier, and also designs things with chocolate! There was a book of all of his creations in the store, which we all viewed. Apparently, the massive block in the middle used to be a block of chocolate, but many people would takes bites out of it or cut a piece with a knife. The only place where you can see his creations are in his store in Paris, where apparently people are more civilized. We were given this beautiful looking piece of chocolate in the third photo, but I chose to save it and eat it later, since I was so full of chocolate. When I finally tasted it, it was very interesting! It was painted dark chocolate with a yuzu, lemongrass, and verbena buttercream inside. Tangy and delicious! Wanda and I walked back to the meeting spot together, because I figured I might as well be guided back to a place I could navigate from. We spoke some more about traveling and said our goodbyes. I was very glad that I treated myself to the tour! I walked back to my hostel and relaxed before heading to the train station. I actually had to go through intense passport control. The woman was asking me so many questions about why I was going to the UK, etc. Finally I made it through and onto the train. I ended up sitting next to a mom and her 2-year-old son. At first, he was crying and I was so annoyed. But then he became a lot happier and was really adorable. His name was Ohio (they were French-Belgian, so it’s probably not spelled that way, but that is how it was pronounced). We played games throughout the 2-hour train ride. Finally, we arrived in London! I took the tube to my hostel, and it was cool remembering how to get around! I honestly didn’t feel like a tourist! I got there pretty late, so I made my bed in my hostel and headed off to sleep. I had a big day ahead of me! So that was my trip to Belgium! Hope you enjoyed reading about it! Going to try to catch up on my time in the UK, so stay tuned!